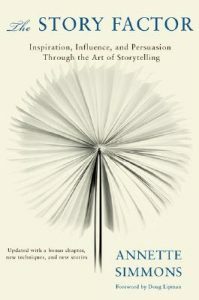 Over one hundred stories drawn from the front lines of business and government, as well as myths, fables, and parables from around the world, illustrate how story can be used to persuade, motivate, and inspire in ways that cold facts, bullet points, and directives can’t. These stories, combined with practical storytelling techniques show anyone how to become a more effective communicator. From ‚who I am‘ to ‚I-know-what-you’re thinking‘; Simmons identifies the six stories you need to know how to tell and demonstrates how they can be applied. This revised edition offers a guide to using storytelling in specific business circumstances, including corporate reorganizations, layoffs, and diversity issues.